Shure has announced that its ULX-D Digital Wireless System and related accessories in the VHF frequency band are available now, with the QLX-D Digital Wireless System following early next year. These VHF band ULX-D and QLX-D systems build on an existing portfolio of Shure wireless products designed to offer alternatives for the increasingly crowded UHF TV Band. The ULX-D and QLX-D VHF systems and accessories offer the same features and benefits that the UHF systems offer, including spectrum efficiency, powerful recharging accessories, networking options, and rugged construction for everyday use. ULX-D Digital Wireless offers efficient RF performance, networked control, Dante digital audio (on ULXD4D and ULXD4Q dual and quad receivers), and AES-256 encryption for professional sound reinforcement. QLX-D delivers defined, streamlined performance with transparent, 24-bit digital audio. 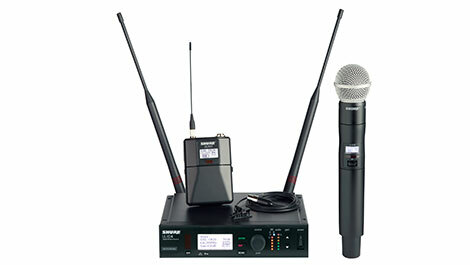 Combining professional features with simplified setup and operation, QLX-D offers wireless functionality for live sound events and installations. A variety of new VHF-ready accessories are available with the VHF versions of ULX-D and QLX-D, including the UA844+V antenna distribution system, UA834V in-line amplifier, UA874V active directional antenna, and UA860V passive, ground-referenced omnidirectional antenna. The UA845UWB antenna distribution system is switchable for UHF/VHF.